"Carnival of the Animals" and "Peter and the Wolf"
Sheraton Grande Walkerhill presents Classic Hand Shadow Musical "Peter and the Wolf" and "Carnival of the Animals." Sheraton Grande Walkerhill introduced a Classic Hand Shadow Musical "Carnival of the Animals" and "Peter and the Wolf" for parents who were looking for that special Christmas present for their children this year. The musical was performed twice on Christmas Day at 11:30 a.m. and 2:00 p.m. This special Christmas family event was available only to the first two-hundred families, due to limited seating. These two classic musicals were designed to provide children both valuable lessons as well as unlimited enjoyment, through gentle, classical music that the whole family can enjoy. 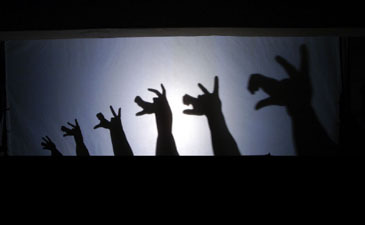 "Carnival of the Animals" was performed through the use of hand shadows, without puppets or stage props. Composed by Camille Saint-Saens, the musical features a veritable zoo of characters including elephants, donkeys and lions, each portrayed by various musical passages and hand shadows. "Peter and the Wolf," composed by the Russian composer Serge Prokofiev, follows the adventures of a disobedient Peter who sets off into the forest to find the legendary wolf, meeting many other animal friends along the way- all represented by different musical themes. Both musicals provide children with wonderful visual entertainment and an appreciation of classical musical instruments. The evening concluded with a "Diablo" performance, providing a finale of spectacle and entertainment for the entire audience. Children were greeted by a team of Santa Clauses who filled the Kayakum Hall and distributed presents to all the children. Also, prior to the start of the musical, the families enjoyed a special six-course lunch. Walkerhill's Classic Hand Shadow Musical "Carnival of the Animals and "Peter and the Wolf" certainly provided families with the most memorable experience of this winter.